1626—London, England: Francis Bacon says in his Sylva Sylvarum, “All instruments that have either return as trumpets or flexions as cornets, or are drawn up and put from as sackbuts, have a purling [murmuring] sound; but the recorder or flute, that have none of these inequalities, give a clear sound” (Bacon 50). 1626—Leipzig, Germany: Johann Hermann Schein, director of music at the Thomaskirche, publishes the collection Opella nova, ander Theil, geistlicher Concerten, which features numerous chamber motets in 4 or 5 parts that include trombone: “O Maria, gebenedeiet bist du” (“trombone o fagotto”), “Siehe, das ist mein Knecht” (“fagot o trombone”), “Also heilig ist der Tag” (1 trombone), “Uns ist ein Kind geboren” (1 trombone), “Selig sind, die da geistlich arm sind” (3 trombones), “Vater unser, der du bist im Himmel” (2 trombones), “Mach dich auf, werde Licht,” (3 trombones), and Nun ist das Heil und die Kraft (3 trombones) (Hadden 128; Collver 163). 1626—Leipzig, Germany: Johann Hermann Schein, Ich will schweigen, a funeral lament. 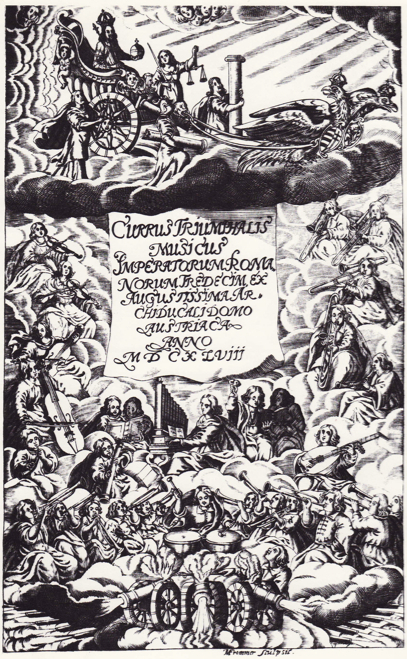 1626—Bologna, Italy: Camillo Cortellini’s collection of concerted masses, Messe concertante a otto voce, includes specific instructions on how instruments are to be used: “The Mass In Domino confido has the concerted Gloria, and where the text is in capital letters, the singer will sing the solo, and where the text is replaced by lines, the trombones or other similar instruments will play soli for the accompaniment of the parts. This can be done without organ if instruments are present…” (Guion, Missing Link). 1626—Venice, Italy: Rovetta specifies trombone in a collection of canzoni. Specifically, Canzon Seconda, a 3-voice work, calls for 2 violins or cornetts and trombone (Winkler 301; Selfridge-Field, Instrumentation). 1627—Bergamo, Italy: Payment records for Assumption Day celebrations at Santa Maria Maggiore show 2 trombones among the 13 instrumentalists (Roche, North Italian 142). 1627-1629—Dublin, Ireland: William Bedell serves as provost of Trinity College of Dublin. A contemporary biographer describes him as being “much dissatisfied with the pompous service at Christ’s church in Dublin, which was attended and celebrated with all manner of instrumental musicke, as organs, sackbuts, cornets, viols, &c, as if it had been at the dedication of Nebuchadnezar’s golden image in the plain of Dura…” (Boydell, Cathedral 140; Parrott, Grett and Solompne Singing). 1628—London, England: Records from the court of Charles I list 9 hoboies and sackbuts (De Lafontaine 66; Ashbee, Records III 32). Elsewhere the following are listed separately as Sagbuttes: John Snowesman, Richard Blagrave, Clement Lanier (Ashbee, Records III 139). 1628—Durham, England: Peter Smart, Prebendary of Durham Cathedral, expresses his puritan disgust with the use of instruments in church: “This makes me call to remembrance, a strange speech little better then blasphemy, uttered lately by a young man, in the presence of his Lord, and many learned men: ‘I had rather goe forty miles to a good service, then two miles to a Sermon.’ And what meant he by a good service? His meaning was manifest; where goodly Babylinish robes were worne, imbroydered with images. Where he might heare a delicate noise of singers, with Shakebuts, and Cornets, and Organs, and if it were possible, all kinde of Musicke, used at the dedication of Nabuchodonosors golden Image” (Smart Sermon 22). Smart brings a lawsuit against John Cosin, fellow-Prebendary and Bishop of Durham, complaining about Consin’s “Popish” activities. Among Smart’s specific complaints are the following: “Article 7: He has divided the morning service into two parts; the six o’clock service which used to be read only and not sung, he chants with organs, sackbuts and cornetts, which yield a hideous noise….Article 8: He enjoins all the people to stand up at the Nicene Creed…which he commands to be sung with organs, sackbuts and cornetts…” (Buttrey). The following year, Smart publishes “A Short Treatise of Altars, Altar-furniture, Altar-cringing, and Musick of all the Quire, Singing-men and Choristers,” wherein he asks, “Can such paltry toyes bring to our memory Christ and his blood-shedding? 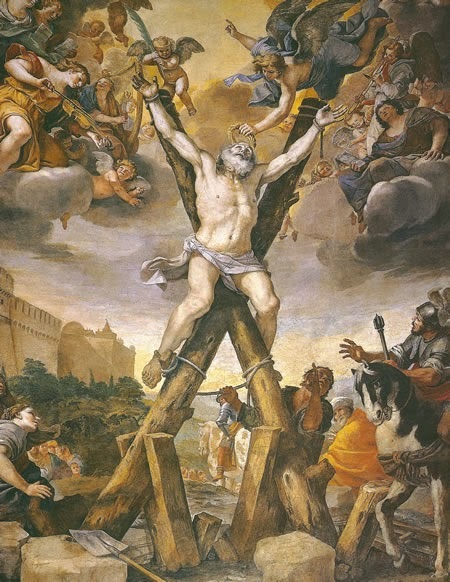 Crosses, Crucifixes, Tapers, Candlesticks…sumptuous Organs, with Sackbuts & Cornets piping so loud at the Communion table, that they may be heard halfe a mile from the Church?” (Smart Altar 19). 1628—Italy: Ottavio Maria Grandi calls for trombone in Sonata Decima Nona, a 5-voice work for violin and 4 trombones, and Sonata Vigesima, a 6-voice work for 3 violins and 3 trombones (Winkler 301). 1628-29—London, England: A payment record from the court of Charles I is made: “To Anthony Bassano, one of his Majesty’s Musitions for the wynd Instruments…for two setts of new hautboyes & Sackbutts & for new Cases to putt them in” (Ashbee, Records III 141). 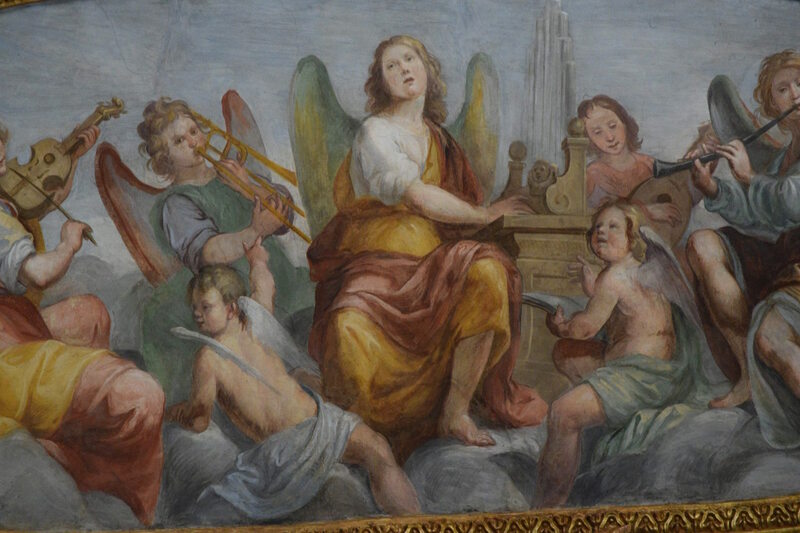 c. 1629—Venice, Italy: Veronese artist Fra Semplice da Verona includes a depiction of a cherub playing trombone in Infant Jesus and Musical Angels, an image framing a pre-existing Madonna in the Convento del Redentore. 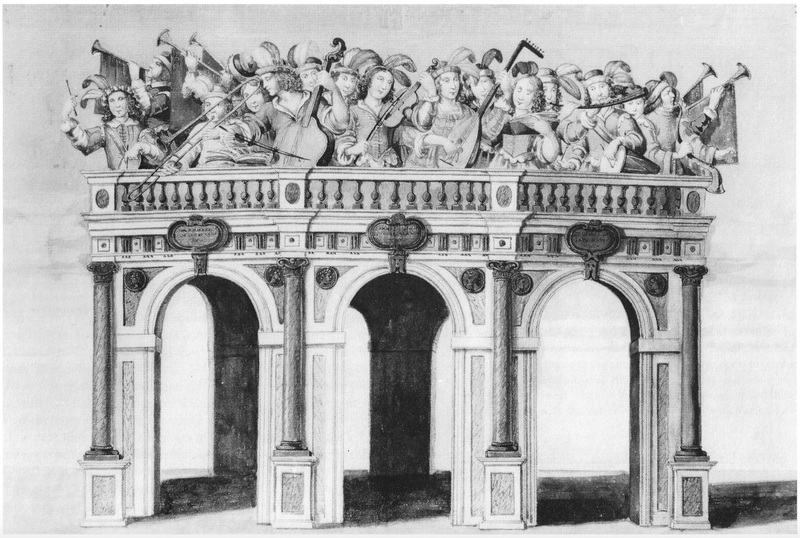 Other instruments being played include cornetto, viol, violin, and lute (see detail and full image below; public domain) (Portogruaro, plate 37). 1629—Palermo, Italy: Bartolomeo Mont’Albano specifies trombone in a collection of his works. Specifically both Sinfonia Settima Castelletti and Sinfonia Octava Fiumicello are 3-part works scored for 2 violins and trombone (Winkler 302; Selfridge-Field, Instrumentation). 1629—Pallanza, Italy: Gasparo Pietragrua calls for trombone in a collection of sonatas and canzoni. Specifially, Canzone La Nozente is a 2-part work scored for violin and violone or cornett and trombone (Winkler 302; Selfridge-Field, Instrumentation). 1629—Brescia, Italy: Pietro Lappi specifies trombone or cornett or violin in his 8-voice Canzon L’Anconitana (Winkler 301). 1629—Venice, Italy: Dario Castello, a member of the piffaro, calls extensively for trombone in a collection of sonatas. Specifically, Sonata Quinta is scored for soprano voice and trombone or violetta; Sonata Sesta is scored for soprano voice and trombone or violetta; Sonata Undecima is scored for 2 soprano voices and trombone or violetta; Sonata Duodecima is scored for 2 soprano voices and trombone or violetta; Sonata Decima Terza is scored for 2 soprano voices and 2 trombones or violette; and Sonata Decima Quarta is scored for 2 soprano voices and 2 trombones or violette (Winkler 301; Selfridge-Field, Instrumentation). 1629—Heinrich Schütz’s collection of works, Symphoniae Sacrae, utilizes trombone extensively, drawing on both the German church tower tradition and Italian polychoral methods. Noteworthy examples include “Fili mi, Absalon” (bass voice accompanied by 4 trombones and organ), “Attendite, popule meus” (bass voice accompanied by 4 trombones and organ), and “Veni, dilecte mi” (3 solo voices accompanied by 3 trombones) (Beulow 274; Whitwell, Catalog Baroque 144). 1629—Nuremberg, Germany: Numerous works from Biagio Marini’s instrumental collection, Sonate, sinfonie, canzoni, passemezzi…, specify trombone: Sonata octava (2 bassoons or bass trombones, bass continuo), Sonata nona (2 bassoons or bass trombones, continuo), Sinfonia terza (2 cornetts, trombone, basso continuo), Sinfonia quarta (2 cornetts, trombone, basso continuo), Canzon terza a 4 (4 trombones or violas), Canzone quarta a 4 (2 violins or cornetts, 2 trombones ad lib, basso continuo), Canzone sesta a 4 (2 cornetts, 2 trombones ad lib, basso continuo), Canzon septima (2 cornetts, basso ad lib, 3 trombones), Canzon octava (2 violins, 4 trombones), Canzon nona (2 violins, viola, 3 trombones), Canzone decima a 6 (2 violins or cornetts, 4 violas or trombones, basso continuo), and Sonata per l’Organo (violin or cornett, trombone ad lib, organ) (Collver 60; Selfridge-Field, Instrumentation; Winkler 301). 1629—Bergamo, Italy: Alessandro Grandi’s O beate Benedicte from the Motetti con sinfonie III is scored for soprano voice, tenor voice, trombone, and violin (Roche, North Italian 86). 1629—Venice, Italy: Carlo Milanuzzi’s Missa primi tone from his Messe a tre voce contrasts a group of 3 vocal soloists with a 4-part vocal choir and another choir of 2 violins and 2 trombones. The trombone lines are independent of the vocal lines (Schnoebelen, The Role of the Violin). 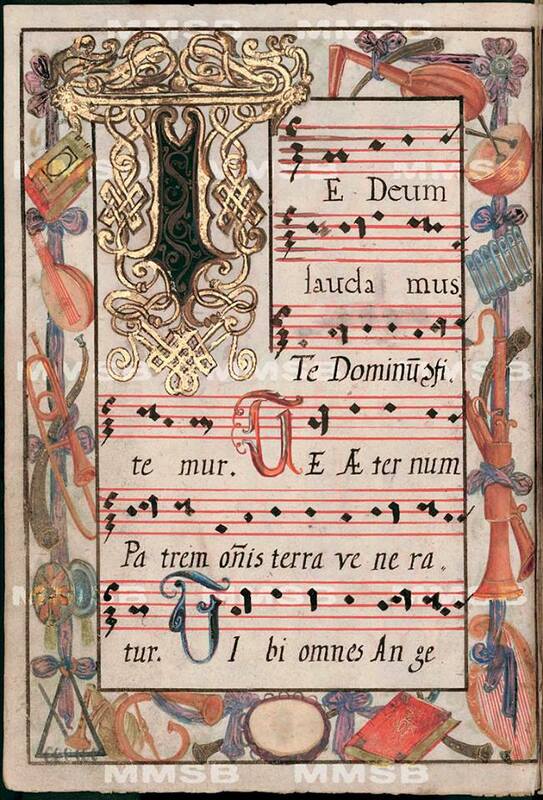 c. 1630—Prague, Czech Republic: A decorative border in “Antiphonarii Praemonstratensis Sionei pars aestivalis” includes what appears to be a trombone (see below image; public domain). Special thanks to Bruce Dickey. c. 1630—Genoa, Italy: A trompe l’oeil balcony by Giovanni Bernardo Carlone and Giovanni Battista Carlone in the palace Villa Spinola alla Prioria di S. Agnese features a well-dressed trombone player among a small group of musicians (see detail and full image below; click to expand; public domain images) (Heck, Guitarists in the Balconies). 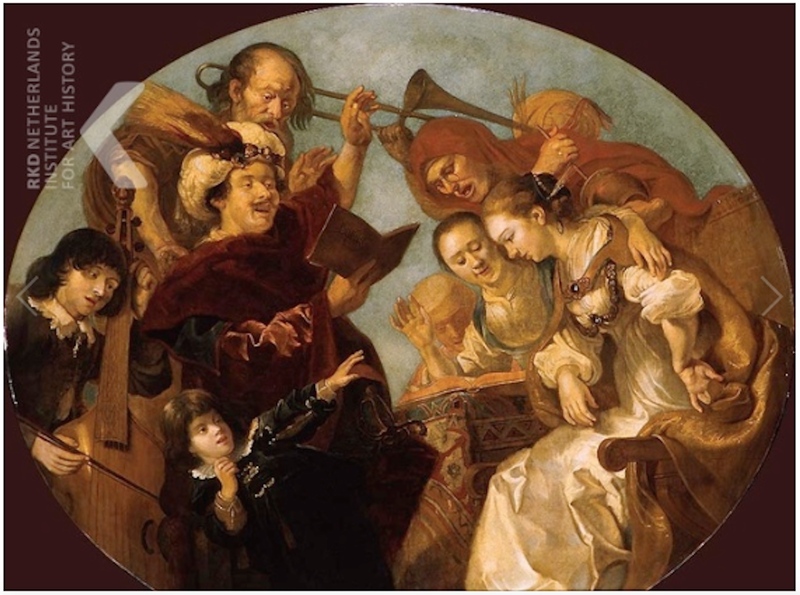 c. 1630—Antwerp, Belgium: A painting on the lid of a harpsichord by Franz Francke (1581-1643) depicts Belshazzar’s feast. A trombone is pictured performing with string instruments and a keyboard (see below image; public domain) (Munich, Bayerisches Nationalmuseum. Cat. No. 174; Hirt, Stringed Keyboard Instruments 263). 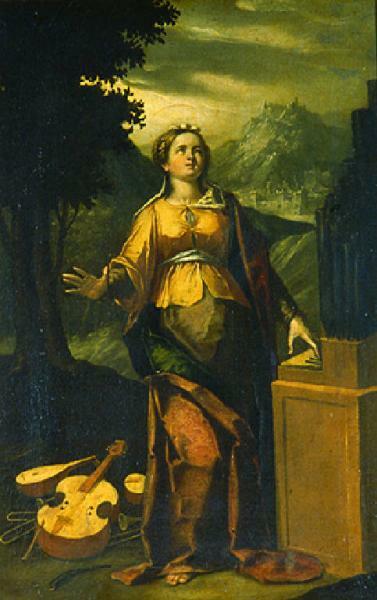 c. 1630—Italian artist Ortensio Crespi’s St. Cecilia includes one fairly clear depiction of a trombone at the foot of the painting, as well as what appear to be two additional partially-obscured trombones on the other side of the viol (see below image; public domain). 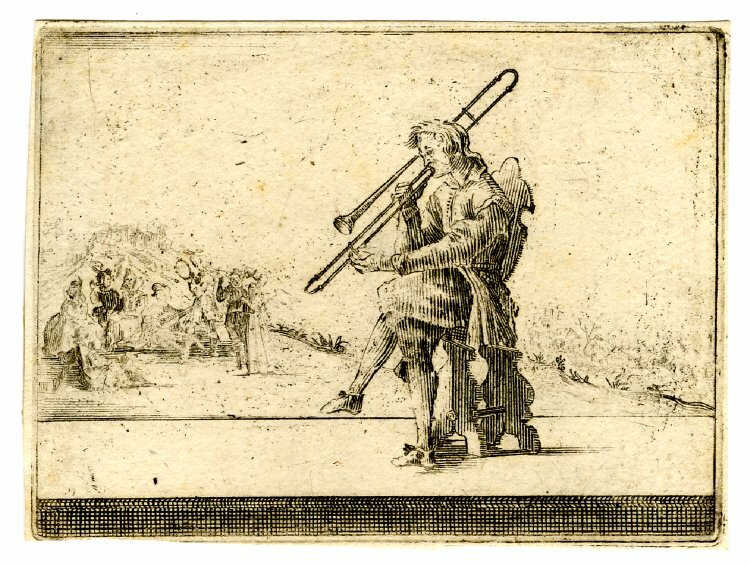 c. 1630—Rome, Italy: An etching from the series Figure con instrumenti musicali e boscarecci by Giovanni Battista Bracelli features a trombone and a serpent (see below image; public domain) (Falletti 107). 1630—Bergamo, Italy: Alessandro Grandi utilitzes trombone extensively in the collection, Raccolta Terza di Leonardo Simonetti. For example, Sinfonia avanti il Gloria is written for cornetto, trombone, and continuo. Several other works in the collection call for trombone prominently as well (Collver 118). 1630—Bologna, Italy: The plague kills nearly a quarter of the city’s population, including Camillo Cortellini, trombonist and leader of the musici, the trombone and cornett subset of the town wind band (Guion, Missing Link). 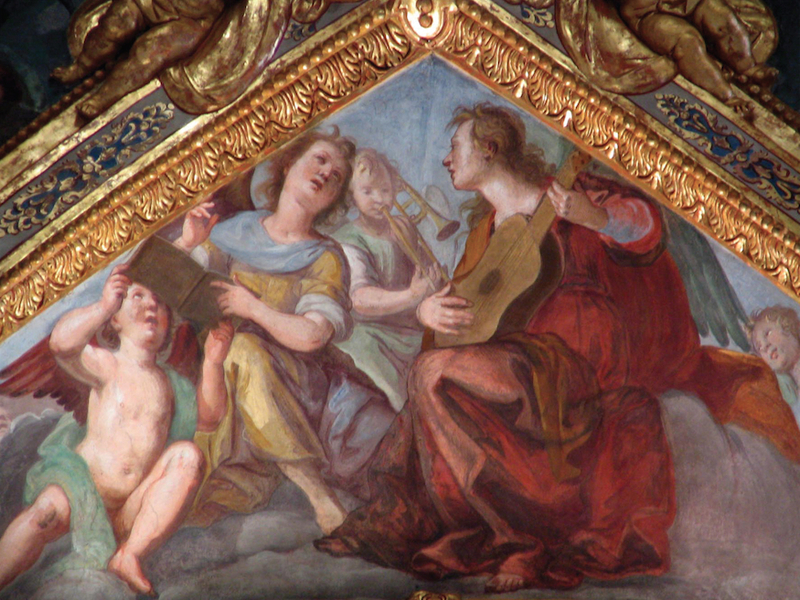 1630s—Members of the violin family replace cornett and trombone as the favored instruments in Italian sacred music (Bonta Ensemble 38). 1630—Durham, England: A preacher expresses his disgust with the current use of music in worship services: “Our Durhamers have been so eager upon piping and singing, that instead of the Morning Prayer at 6 of the clock, which was wont to be read distinctly and plainly…they brought in a solemne Service, with singing and Organs, Sackbuts and Cornets, little whereof could be understood of the people, neither would they suffer the Sacrament to be administered without a continuall noise of Musick, both instrumentall and vocal, to the great disturbance of these holy actions” (Whitwell, Baroque 195). 1630—Venice, Italy: The Ospedale (or Hospital) di San Lazaro e dei Mendicanti, an orphanage and school, replaces an old trombone that has been in their possession, indicating the nuns there have probably played and taught the instrument for some time. Indeed, other sources indicate that trombone is one of the instruments taught at ospedali, and inventories from the Mendicanti from slightly later include multiple trombones (Baldauf-Berdes 130, 141, 171). 1630—Venice, Italy: Alessandro Grandi’s collection of large-scale church works, Raccolta terza, is published posthumously. It contains numerous works that use trombones prominently. For example, Nisi Dominus is scored for SATT soloist, SATB ripieno, and 3 trombones. The trombones play in both tuttis and solos (Roche, North Italian 127). 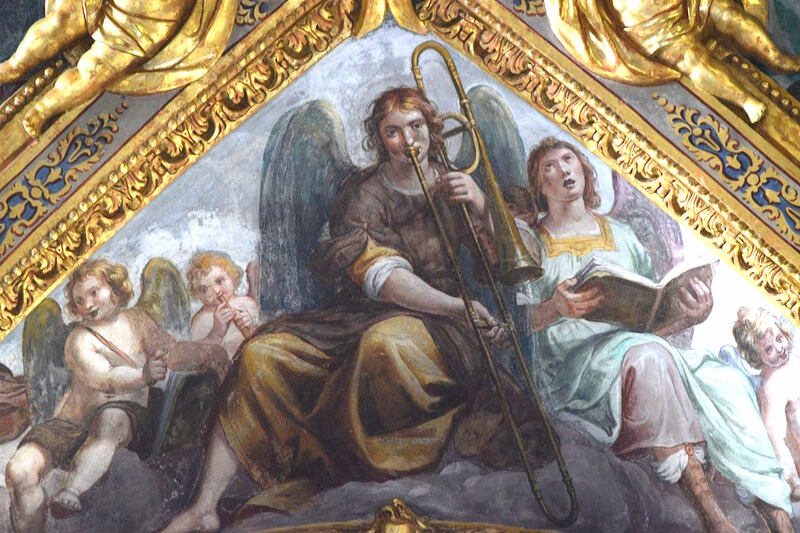 In Messa concertata, trombones are featured among several different solo groupings (Roche, North Italian 143). 1630—Venice, Italy: Giovanni Croce’s Laudate pueri, which would have been written before his death in 1609, is published posthumously. The work features three 4-part choirs, at least one of which includes trombones (Kurtzman Monteverdi Vespers, 124). 1631—Venice, Italy: Monteverdi’s “Mass of Thanksgiving,” a solemn mass for the feast of S. Maria della Salute in thanksgiving for the delivery of Venice from the plague, includes trombones (Mansfield, Some Anomalies). 1632—Bologna, Italy: In the convent Santa Cristina, nuns accompany themselves, according to contemporary Mauro Ruggeri, “with various instruments, violins, trombones, harps, and such like” (Monson, Disembodied 52). 1632—London: Edward Kellie, Master of the Chapel Royal in Scotland, visits London and “…carryed home an organist and two men for playing on cornetts and sackbuts…most exquisite in their severall faculties” (Parrott, Grett and Solompne Singing; Whitwell, Baroque 194). 1632-33—Durham, England: Cathedral records show employment of 2 sackbut players, 2 cornett players, and 2 organists (Buttrey). 1633—Biecz, Poland: A carving in an ivory coin cabinet, made by Christoph Angermaier for Elizabeth, wife of Maximilian I of Bavaria, depicts a group of town musicians, including a trombonist (Town Musicians in Poland, Biecz Museum, Poland) (Lesure 14; Whitwell, Baroque 3; Buchner 106). See below image; public domain. 1633—Italy: Sienese priest Montebuoni-Buondelmonti is greatly impressed with the playing of Alberto Gregori, a trombonist employed at the Siena cathedral. He remarks that Gregori “needs only the mouthpiece to play anything for which other players need the entire instrument” (Onde con il bocchetto solamente ha fatto esperienza di tutto cio che fanno gl’altri con il trombone intero). Gregori also served as maestro di cappella at the Palazzo Pubblico and director of musical activities at the hospital church of the Santissima Annunziata (Reardon Agostino Agazzari 53). c. 1634—A print, possibly by French artist Jacques Callot, shows a solitary trombonist casually playing while sitting cross-legged on a chair (see below image; public domain). Notice the similarity to the Bracelli etching, above (c. 1630). 1634—Italy: A collection of Masses by Chinelli is scored for voices and trombones (Whitwell, Baroque 213). 1634—Canterbury, England: records show that the Canterbury Cathedral has substituted two corniters and two sackbutters for the deacon and subdeacon called for by authorities (Woodfill 149). 1634—England: James Shirley’s masque, The Triumph of Peace, includes several sackbuts; 6 musicians are listed under the heading “Hautboy and Sackbutts,” while another player, listed under “King’s Musicians for the Violins,” is described as “low tenor violin, hautboy and sackbut, also musician for the wind instruments, also a wait of the city of London” (Lefkowitz, The Longleat Papers). 1634-1635—Canterbury, England: Payment is made at the Canterbury Cathedral “for prickinge one service in both Sackbut bookes” (Bowers 445). 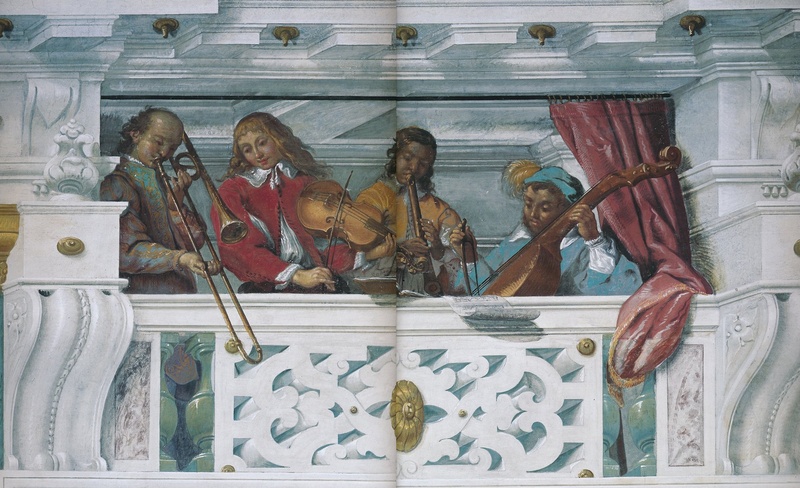 c. 1635—Copenhagen, Denmark: A ceiling painting in the Rosenborg Castle depicts musicians of the court of Christian IV of Denmark (1577-1648), including 3 trombonsits (see 2 details and full image below; public domain) (Hindley plate 17). c. 1635—Naples, Italy: According to an inventory probably taken in the 1630s, the Conservatorio dei Poveri di Gesu Cristo owns 2 trombones, 3 cornetts, and violins of various sizes (Arnold, Instruments and Instrumental Teaching; Guion, Missing Link). 1635—England: The verse anthem “When the mountains were brought forth” by William Lawes is described in the Chapel Royal Anthem Book as “An Anthem with verses for Cornetts and Sagbutts” (Morehen 141; Woodfill 191). 1635—Oxford, England: An inventory of instruments located in the shop of John Gerard, who is probably a musical instrument dealer, includes a sackbut (Fleming, Some Points Arising from a Survey). 1635—Germany: An engraving of Johann Andreas Herbst, Kapellmeister in Darmstadt, Frankfurt, and Nuremberg, by Sebastian Fürck, features a depiction of a trombone in the outside border (middle right) (see below image; public domain) (Kinsky 167). 1635—England: Records for the King’s Music list Hautboys and Sackbuts together instead of separately. The group consists of 12 players (Woodfill 305). 1635-1642—Poland: The court ensemble at the chapel of Duke Wladyslaw Dominik Ostrogski-Zaslawski (d. 1656), which is comprised of some 12 to 17 vocalists and instrumentalists, includes multiple trombones (Przybyszewska-Jarminska, The History of Music in Poland: The Baroque, Part 1, p. 88). 1636—Poland: From at least this year, a chapel is maintained by Tomasz Zamoyski, the son of Grand Chancellor. 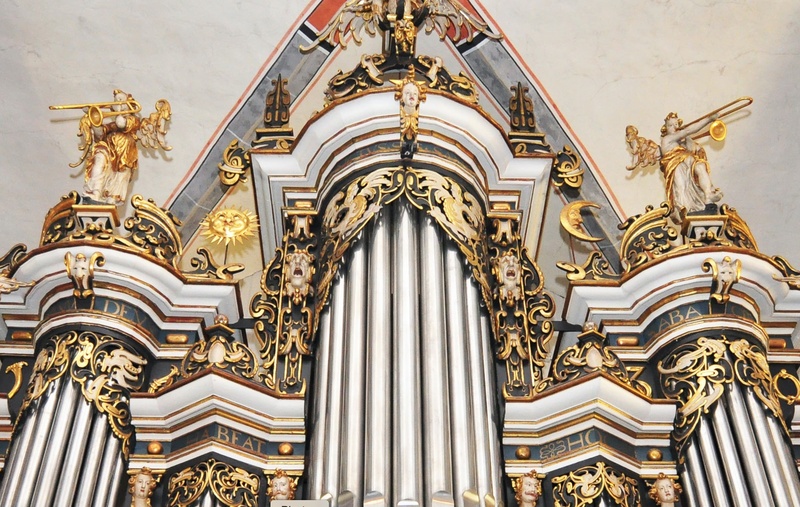 Among the 11 musicians known to have worked at his residence, and probably at the collegiate church in Zamosc, are 2 trombonists, 2 organists, 2 violinists, a curtalist, a cornettist, and 3 singers (Przybyszewska-Jarminska, The History of Music in Poland: The Baroque, Part 1, p. 88). 1636—Paris, France: Mersenne writes, “If another method is not used to play the trombone [sacquebute]than to play the trumpet, it imitates the tone of the aforesaid trumpet, which is considered vicious and unsuited for concerts (Mersenne 272; Mersenne-Chapman 343). Speaking of the trombone’s technical abilities, he remarks, “Those who use it [the trombone] well perform diminutions of sixteen notes to the measure” (Mersenne 272; Mersenne-Chapman 343). Mersenne also observes, “Musicians have invented many instruments to mingle with voices, and to make up for the defect of those who perform the bass and treble, since singers who have low bass voices are very rare. That is why the bassoon is used, and the sackbut and the serpent, just as the cornet is used to supplement those of the treble which are not usually good.” Mersenne includes an engraving of a trombone (see facing image; public domain) (Mersenne-Chapman, 348). 1636—France: Mersenne, describing the shawm band, explains that it is used for large assemblies, such as ballets (though violins have replaced shawms there), weddings, village festivals, and other public celebrations. His musical example includes 2 treble shawms, 2 tenor shawms (or alt pommern), sackbut, and bass. 1636—France: Mersenne explains that in France, it is customary to create a bass trombone by simply adding a crook or tortil to the tenor trombone, lowering the pitch by a fourth (Bate 136). 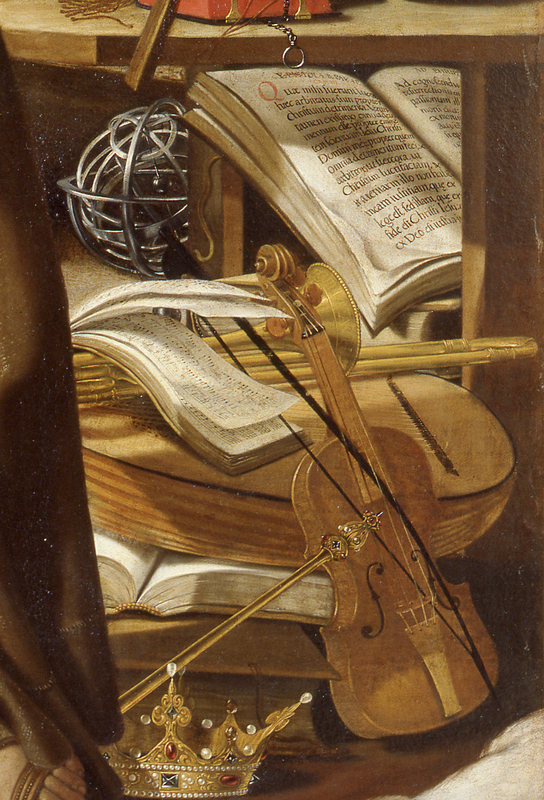 1636—London, England: Charles Butler voices his opinion against using strings in church services in his Principles of Musick: “Becaus Entata [string instruments] ar often out of tun; (which soomtime happeneth in the mids of the Musik, when it is neither good to continue, nor to correct the fault) therefore, to avoid all offence (where the least shoolde not bee givn) in our Chyrch-solemnities onely the Winde-instruments (whose Notes ar constant) bee in use” (Parrott, Grett and Solompne Singing). 1636—Assisi, Italy: Giovanni Battista Buonamente uses trombones prominently in his collection, Sonate et canzoni a due, tre, quattro, cinque et a sei voci. Specific works include Canzon a 5 for 2 cornetts or violins, 3 trombones, and continuo; Sonata a 5 for violin, cornett, 3 trombones (“trombone contralto, trombone tenor, trombone basso”), and continuo; Sonata a 6 for violin, cornett, 3 trombones (“trombone contralto, trombone tenor, trombone basso”), theorbo, and continuo; Sonata a 6 for 2 cornetts or violins, 4 trombones, and continuo; and Canzon a 6 for 2 violins and 4 trombones (Collver 46; Winkler 302; Allsop 148). 1636—Württemberg, Germany: The court chapel inventory includes 2 trombones (Whitwell, Baroque 203). 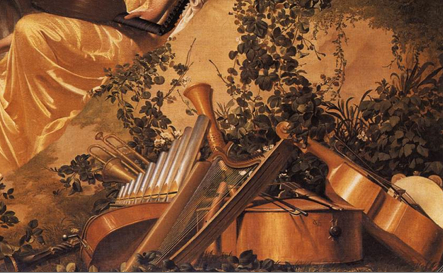 1636—Biagio Marini, Canzon from Sonate, symphonie… for 4 trombones and continuo (Marini). 1636—Santo Domingo, Colombia: Juan Criollo, a Creole slave and professional musician from Santafé, becomes a trombonist at the Santo Domingo Convent. He calls himself sacabuche de chirimía (“sackbut player of a group of shawms”) (Bermúdez). 1636—San Francisco, Colombia: Juan Sacabuche, a slave and professional musician from Cartagena, becomes a trombonist at San Francisco Convent (Bermúdez). 1636—Seville, Spain: Organist, composer, and theorist Francisco Correa de Arauxo makes the following comment in his treatise, Facultad orgánica, in regard to a trombone-playing colleague: “There was in that holy church in Seville a trombone [sacabuche] player named Gregorio de Lozoya, a man remarkable in knowledge and especially in skill of embellishing on this instrument. One critic said of him that he had ruined [echado a perder] many trombone players of his time, because in imitating his embellishments they revealed faults that they hid [when] playing quietly; that is, plainly [unembellished]” (Lash 218-219; Jacobs, Francisco Correa 4). 1637—Italy: Francesco Fiamengo scores for 2 violins, viola, and trombone (or tiorba) in his Sonata Pastorale (Winkler 302). 1637—Bologna, Italy: A government document defines the city’s piffari (wind band) as an ensemble consisting of 4 cornetts and 4 trombones (Dickey, Cornett and Sackbut 113). 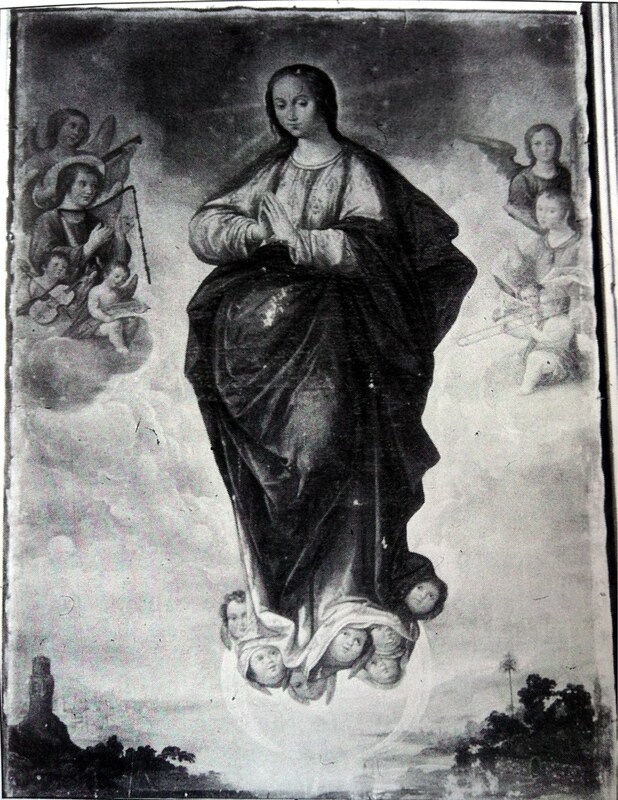 1637—Bergamo, Italy: Music for Assumptiontide at Santa Maria Maggiore includes trombone (Roche, Maggiore). 1637—Asolo, Italy: J. Ganassi calls for trombone in a collection of canzoni (Selfridge-Field, Instrumentation). Specifically, he scores for violin and trombone in Canzon Prima, Canzon Seconda, and Canzon Terza (Winkler 302). 1637—Leipzig, Germany: Tobias Michael, director of music at the Thomaskirche, publishes Musicalischer Seelen-Lust ander Theil. A collection of works for voice and a variety of instruments, it features numerous works that include trombone: “Wo der Herr nicht das Haus bauet” (2 trombones), “Wie lieblich sind auff den Bergen” (“trombone grosso”), “Gott schweige doch nicht also” (single trombone) (Hadden 130). 1637—England: Exeter requires “two new Shagbutts and two new Cornetts to be provided for the service of the Quire with all convenient speed” (Payne 146). 1637—Netherlands: A drawing by Cornelis Saftleven depicts a seated trombonist holding the instrument in what would appear to be a somewhat unorthodox manner (see below image; public domain) (Naylor 97). 1637-45—Ferdinand III reigns as emperor of Austria. An avid supporter of music, he is also an amateur composer himself who uses trombones in many of his compositions (Guion, Trombone 4). 1637-69—Vienna, Austria: Antonio Bertali (1605-1669) is employed at the Imperial Court, where he writes several sonatas that employ trombone (Wigness 3). 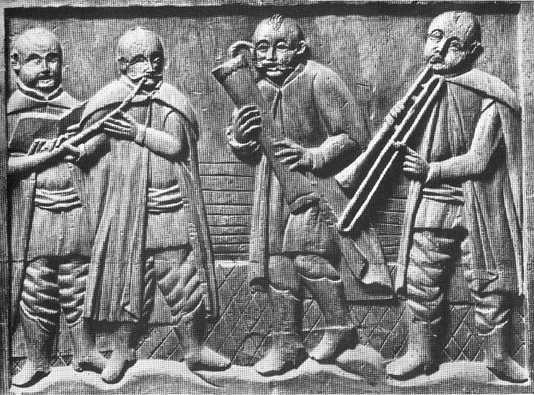 1638—Cracow, Poland: The chapel ensemble at St. Mary’s Church, founded by Cracovian burghers with a charter from King Wladyslaw IV, initially comprises 7 musicians: 3 trombonists, 3 violinists, and an organist (Przybyszewska-Jarminska, The History of Music in Poland: The Baroque, Part 1, p. 103). 1638—Dublin, Ireland: Records show that Two Sagbutts and two Cornetts are paid for their regular services at Christ Church Cathedral (Boydell, Cathedral 140; Boydell, Music at Christ Church, 70). Elsewhere in the same record, the same year, the terms Sakebutt and Sacke-but are used (Boydell, Music at Christ Church, 72, 83). 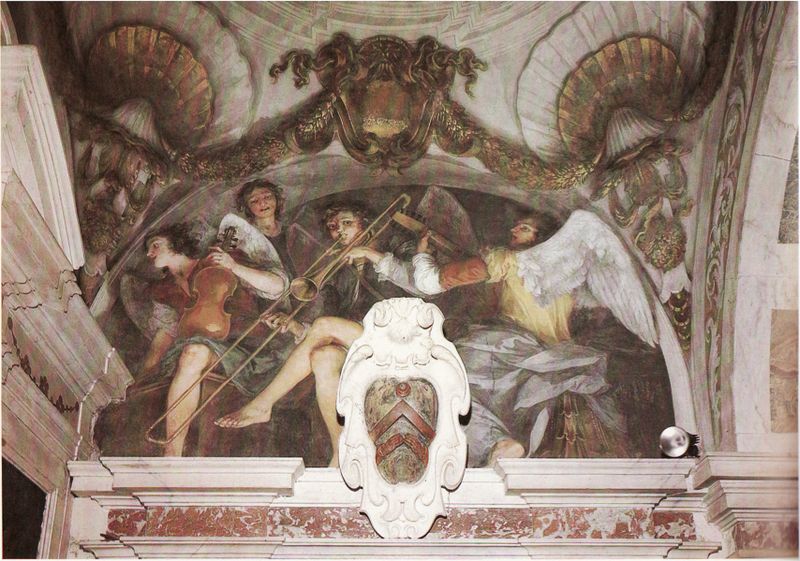 1638/44—Schleiz, Germany: A painting by Paul Keil on the left organ shutter in the Bergkirche includes an angel trombonist among several angel musicians (see below image; public domain) (Die bemalten 108-09). 1638—Dublin, Ireland: A petition is made by the dean for the payment of salaries due to the choir and the sackboots at the Christ Church Cathedral (Boydell, Cathedral 142). 1638—London, England: Records for household of King Charles I include “Warrant to swear Robert Strong a musician to his Majesty for the wind instruments, who is to wayte and serve upon the double sackbut and among the violins, in the room and absence of Robert Parker who through infirmities incident to old age is almost past service” (De Lafontaine 100). 1638—Orvieto, Italy: Molli calls for violino, liuto, and trombone in a collection of his works (Selfridge-Field, Instrumentation). In addition, he scores for 2 violins and trombone in Sinfonia La Liera and Sinfonia La Viviana, and he scores for 3 violins and trombone in Sinfonia L’Anguillona and Sinfonia La Ludovisia (Winkler 302). 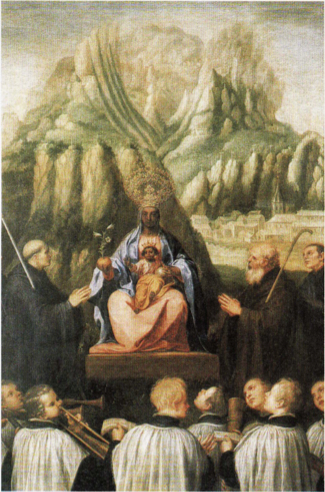 1639—Spain: Juan Ricci’s painting, The Virgin of Montserrat, depicts a choir accompanied by cornett, 2 shawms, trombone, and curtall (see below image; click image to expand; public domain) (Museum of Montserrat, Barcelona, Spain) (Remnant West 203). 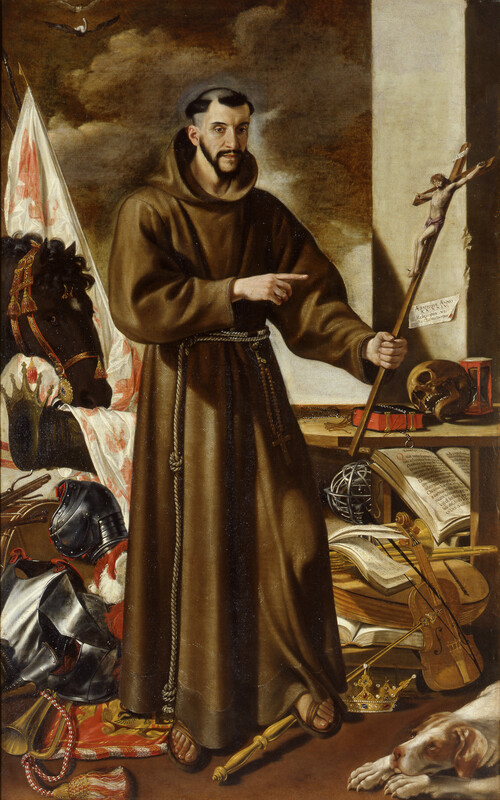 1639—Assisi, Italy: Repairs done on a trombone owned by San Francesco cathedral indicate the likely use of the instrument. The years later, in 1641, an inventory of the contents of the chambers of the maestro di cappella includes trombone (Allsop 88). 1639—Modena, Italy: Marco Uccellini calls for trombone in a collection of his works (Selfridge-Field, Instrumentation). Specifically, his Sonata Prima is scored for violin and trombone, and his Sonata Duodecima is scored for 3 violins and trombone or bassoon (Winkler 303). 1639—Stockholm, Sweden: An instrument that is possibly the oldest surviving contrabass trombone is manufactured by Georg Nikolaus Oller. The instrument is very long and does not utilize a double slide (Gregory 34). It is held in Musikmuseet, Stockholm (Herbert, Trombone 312). 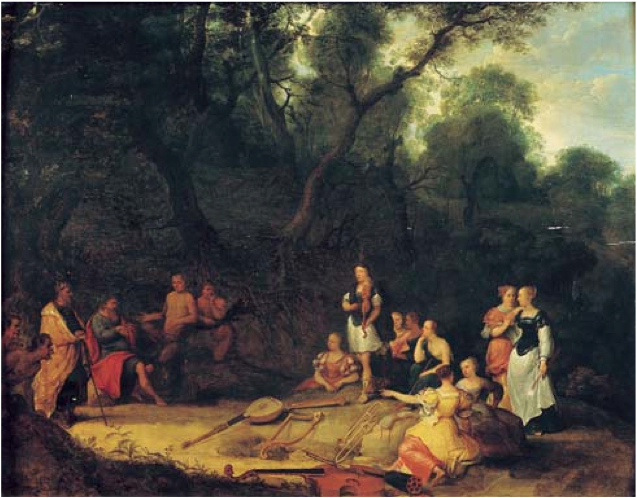 1639—Flemish artist Adriaen van Stalbemt paints Midas Listening to Apollo, which includes a trombone among several other instruments resting on the ground (see below image; public domain). For several similar trombone images, see Pick That Thing Up and Play! 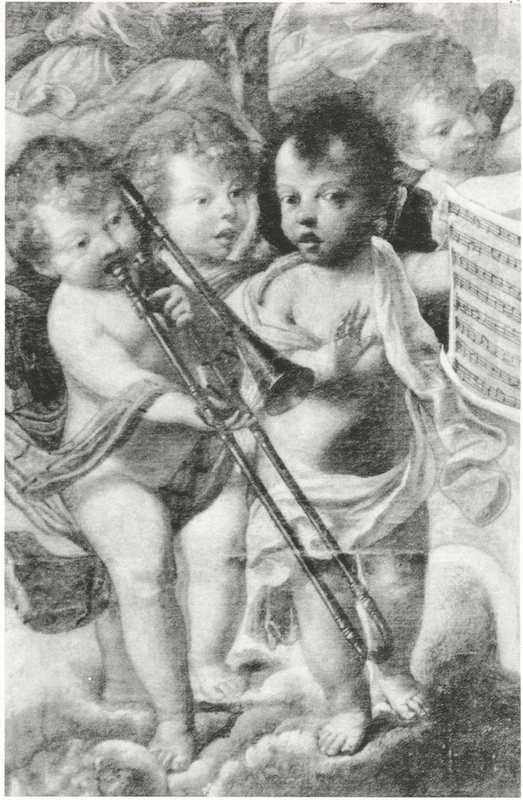 9 Trombone Paintings from 17th-Century Flanders. 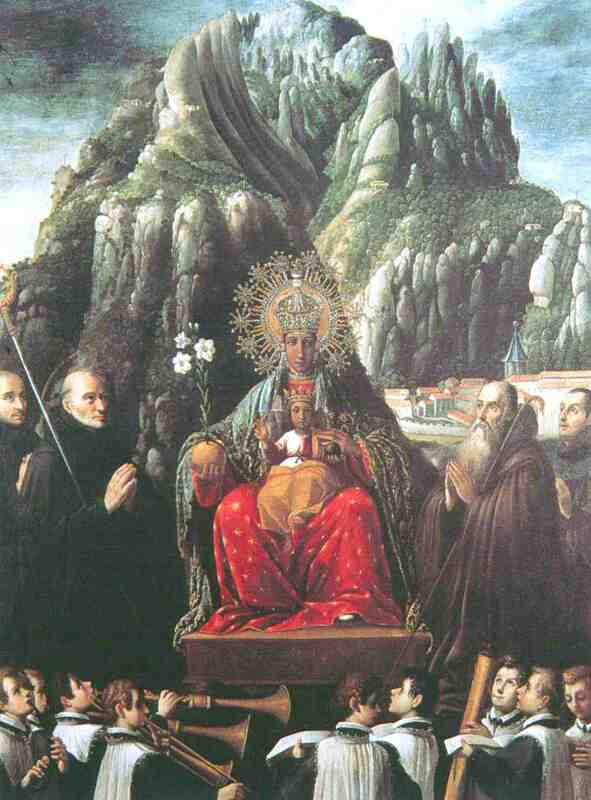 c. 1640—Spain: Alonso Cano’s The Virgin of Montserrat, a painting very similar to Ricci’s 1639 painting of the same name (see above) includes a depiction of what appears to be a child perfoming on trombone (see detail and full image below; public domain) (Usandizaga 61; Museum of Real Academia de Bellas Artes de San Fernando). 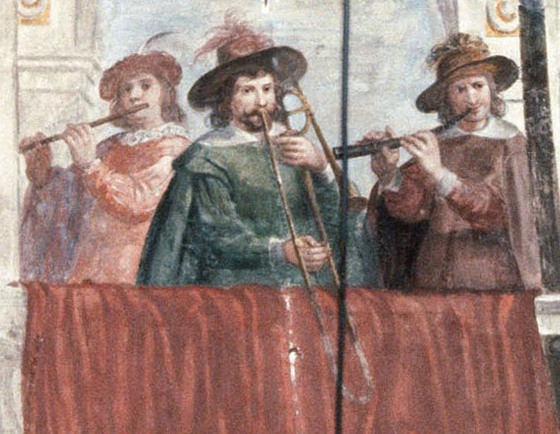 Yet another 17th century painting of the same name, Francisco Chiwant’ito’s 1693 painting from Cuzco (Peru), also includes a child-trombonist in the foreground of the image (see 1693, below). 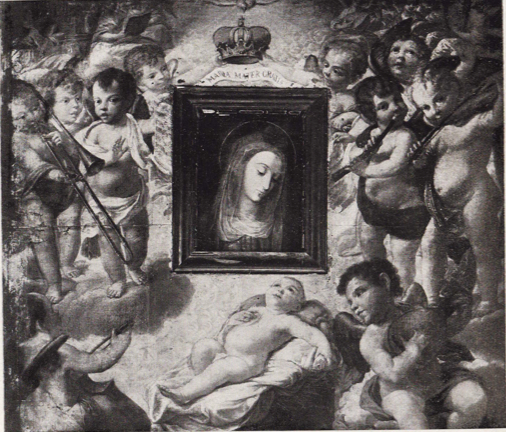 c. 1640—Carmona, Spain: Juan de Castillo’s Inmaculada Concepción in Convento de la Trinidad includes a putto playing trombone (see middle-right of below image; public domain). c. 1640—Poland: Marcin Mielczewski’s Missa Cerviensiana calls for alto trombone, 2 tenor trombones, and bass trombone (Przybyszewska-Jarminska, Baroque part I, 543). c. 1640—Poland: Marcin Mielczewski’s Missa Sancta Anna calls for alto trombone and 2 tenor trombones (Przybyszewska-Jarminska, Baroque part I, 543). c. 1640—Poland: Marcin Mielczewski’s Missa triumphalis calls for alto trombone, 2 tenor trombones, and bass trombone (Przybyszewska-Jarminska, Baroque part I, 543). c. 1640—Poland: Marcin Mielczewski’s Vesperae Dominicales II calls for alto trombone as a substitute for alto voice, tenor trombone as a substitute for tenor voice, and bass trombone as a substitute for bass voice in 2 of 4 choirs (Przybyszewska-Jarminska, Baroque part I, 544). 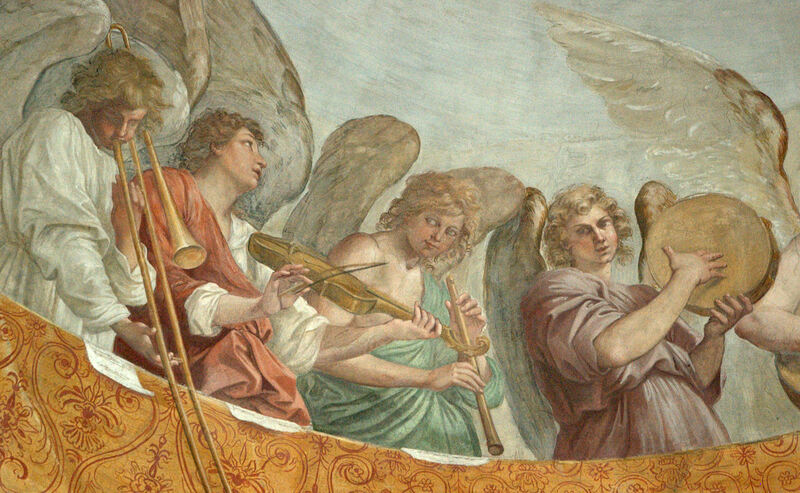 c. 1640—Genoa, Italy: Four different paintings in Basilica della Santissima Annunziata del Vastato feature angels playing trombone (see below 4 images; public domain) (photo credit: Catalina Vicens; see also Heck, Guitarists in the Balconies). c. 1640—England: Henry Loosemore (d. 1670) writes A Verse for y Organ A Sagbot Cornute & Violin (Collver 59). 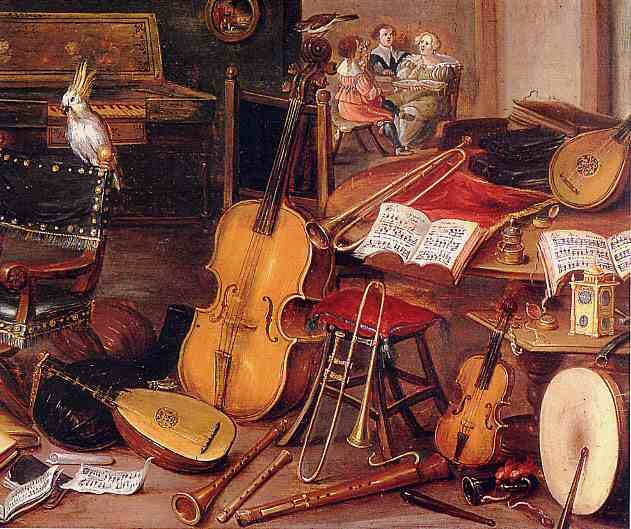 c. 1640—Antwerp, Belgium: Jan van Kessel’s Allegory of Hearing depicts a room with numerous instruments, including a trombone leaning against a stool (see detail below; public domain). 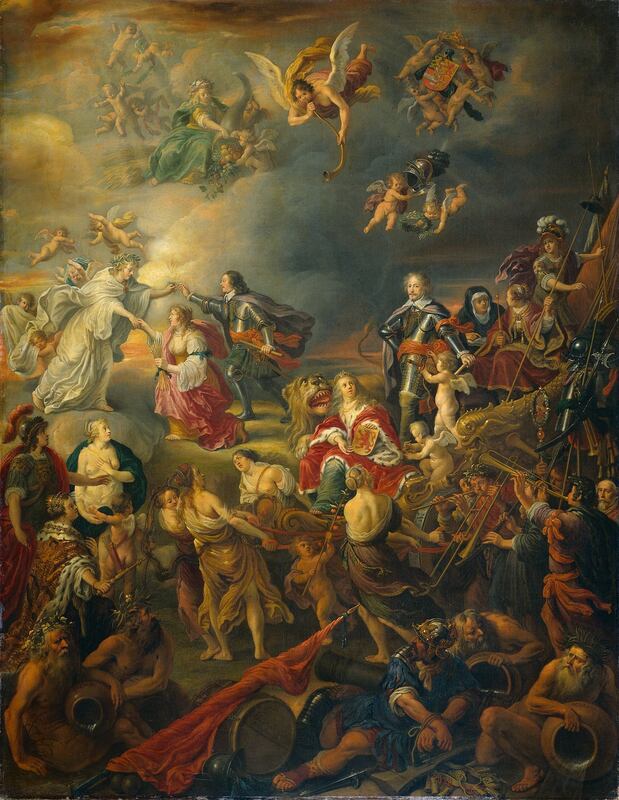 The image is similar to a painting on which the artist collaborated with Hendrik van Balen and Jan Brueghel (see c. 1625, above). c. 1640—Caltagirone (Sicily), Italy: By this approximate date, the standard makeup of the capella, a group of musicians maintained by the city to perform in various churches as appropriate, is the following: maestro, SATB, violin, lute, cornett, trombone, and organ (Dixon, Review of Musica Sacra). 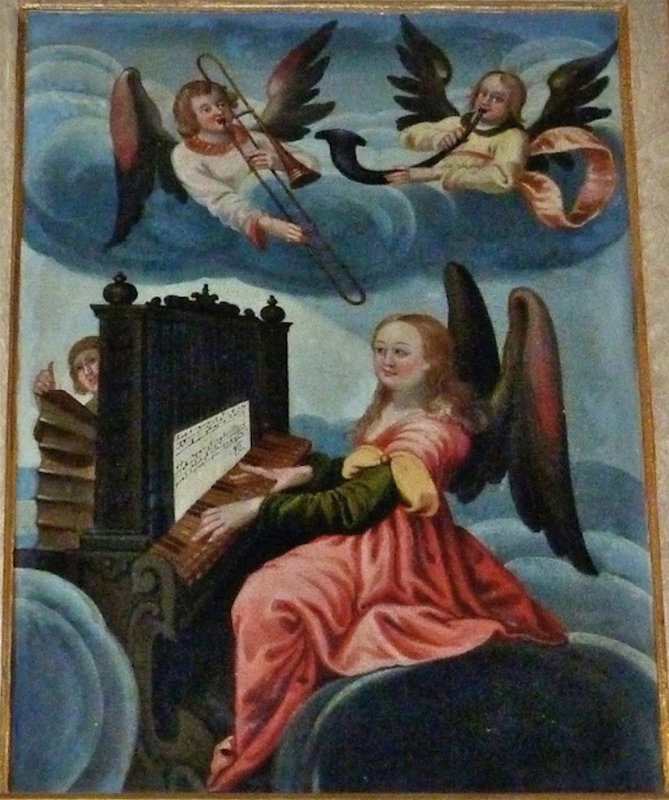 c. 1640—Goslar, Germany: A painting at the church of St. Jakobi includes an angel playing trombone (see below image; public domain). 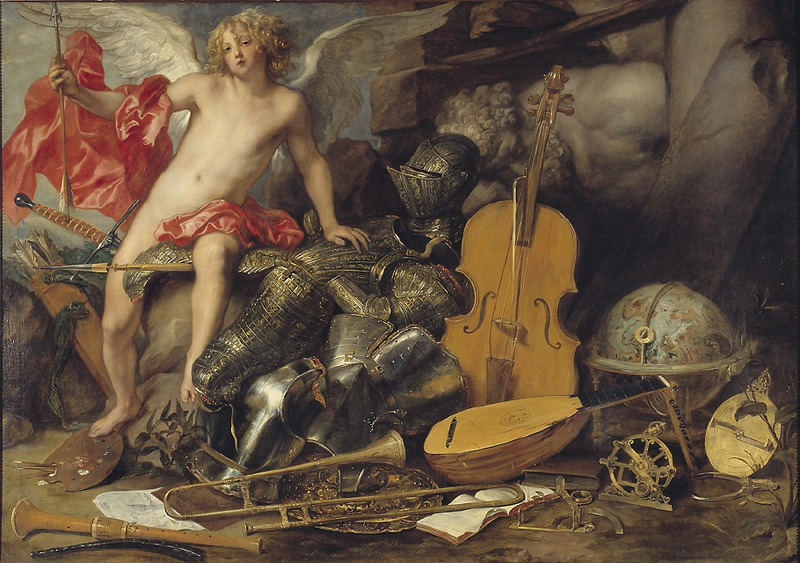 c. 1640—Antwerp, Belgium: Flemish artist Thomas Willeboirts Bosschaert (1614-54) paints Amor Triumphant among Emblems of Art, Science, and War, which includes a trombone in the foreground (see below image, click to expand; public domain) (Wikimedia commons; Heinrich 507; National Museum, Stockholm). 1640—Italy: Sinfonia La Barbisona by Gregorius Urbanus is scored for 2 cornetts and trombone (Winkler 303). 1640—King’s Music (England) includes as many as 11 sackbut players. Many of them play other instruments as well. 1640—Italy: Gregorio Urbano writes Sacri armonici, which includes a work for trombone, 2 cornetts, and organ (Collver 70). 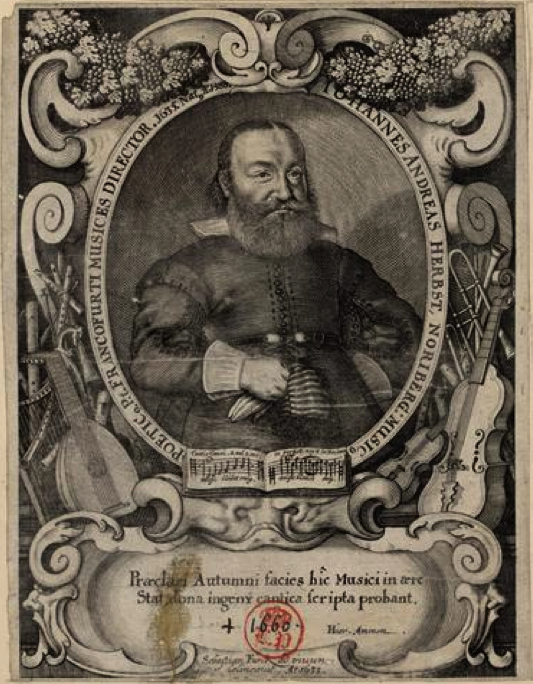 1640—Cracow, Poland: In a literary work by Aleksander Obodzinski entitled An Ancient Trove of Polish Monarchs, the author praises the musicians of Cracow, including trombonists: “Many players will you find—prominent and famous…regals and instruments, prestigious trombones [puzany] In Cracow perform many fair pavans of their own” (Przybyszewska-Jarminska, The History of Music in Poland: The Baroque, Part 1, p. 154). 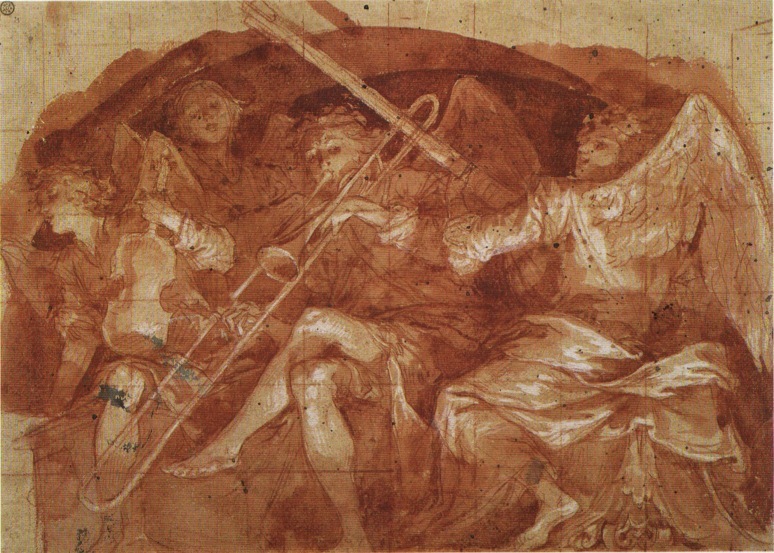 1640—Prague, Czech Republic: A ceiling painting in the Pauline monastery in Prague depicts what appears to be a pure consort of 3 trombonists being led by a Kapellmeister (see facing image; public domain) (Volek plate 147). 1640-49—England: Inventories of Cambridge University Musicians list a Sackbutt, held by university musitian William Tawyer (d. 1640). 1641—London, England: As part of festivities connected to the entry into London of Charles I on his return from Scotland, “After dinner, the Lord Major, with his brethren the Aldermen and the 500 horse conducted his Majesty from the Guild Hall with 14 trumpets with Banners, in Scarlet Cloaks, Sac-buts, Cornets, and all instruments of musick usuall, with Bells ringing at 121 parish Churches, where there was no failings in expressions of love and loyalty by the people, as appear’d by their shouts and acclamations…” (Englands Comfort 005). 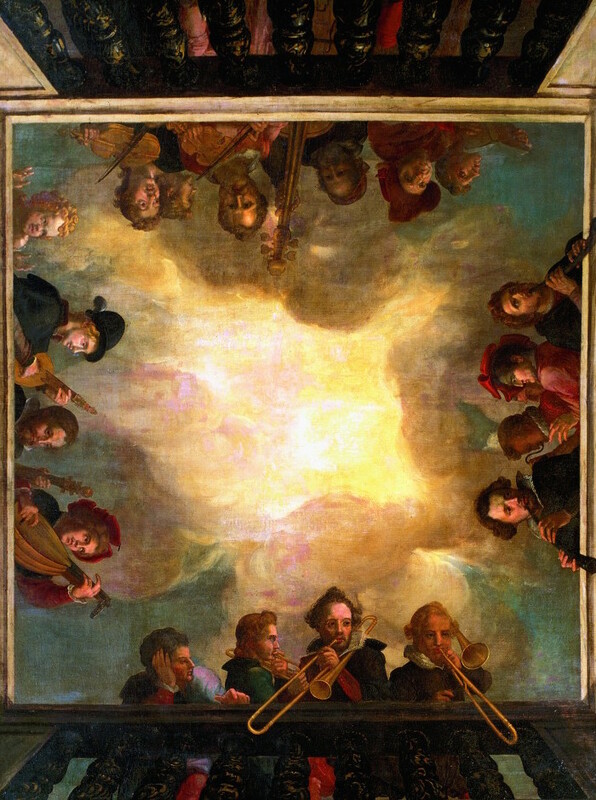 c. 1641—Prosto di Piuro, Valchiavenna, Italy: A fresco in the vault of the presbytery of chiesa dell’Assunta painted by either Giovan Battista Recchi or his brother, Giovan Paolo Recchi, includes a trombonist among several angel musicians (see below image; public domain) (Pescarmona 77). 1641—Italy: Monteverdi’s “Gloria” that appears in his Selva morale specifies an instrumental ensemble of 4 viole da brazzo or 4 trombones, and 2 violins (Schnoebelen, The Role of the Violin). His setting of “Beatus vir” (Psalm 111) requires 3 viole da brazzo or trombones (Tim Carter, Music in Late 232). 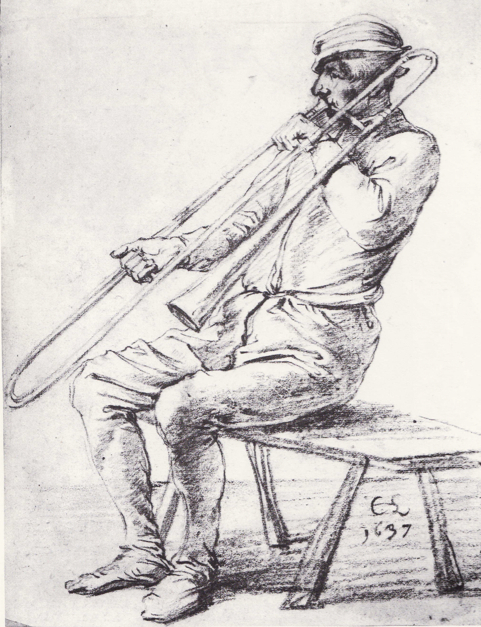 1641—Johann Vierdanck (c.1605-1646) calls for trombone in several works contained in the collection Erster Theil newer Pavanen, Gagliarden, Balletten und Correnten. Highlights include 2 sonatas scored for cornett, 3 trombones, and continuo, as well as a sonata for 2 cornetts and 3 trombones (Collver 72). 1641—Bologna, Italy: Giacomo Predieri begins a long career as trombonist in Concerto Palatino, the city wind band, where he continues until 1694. 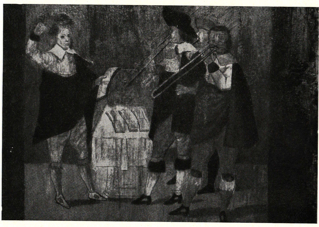 According to Crowther, this ensemble performs at wide variety of ceremonial activities: “By the mid-seventeenth century the band’s duties were largely ceremonial. It played daily on the balcony of the Palazzo Comunale, and had a writ to play on the streets and in the city churches. Its home ground, however, was the Piazza Maggiore, ‘a space where the sacred and the profane could meet on equal terms for all civic religious ceremonies.’” Giacomo also serves as a singer at San Petronio (1636-1657) and vice maestro di cappella (1650-1657) (Guion, Missing Link; Crowther, Oratorio in Bologna 37). 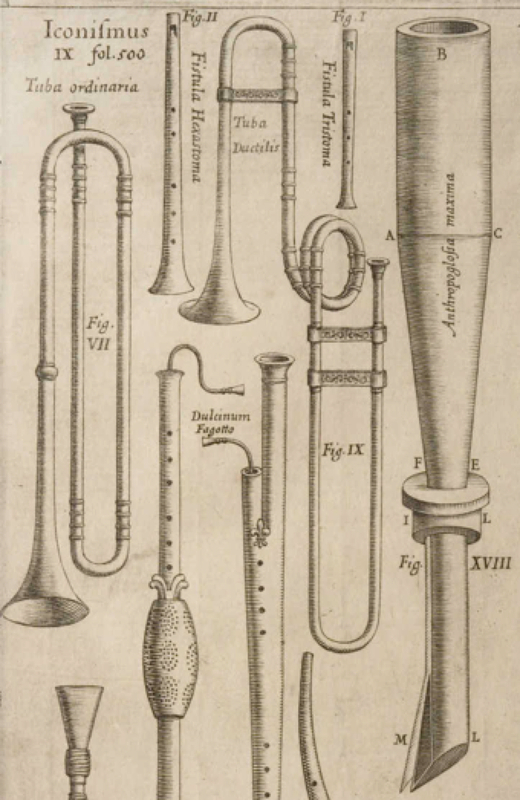 1642—Hamburg, Germany: Kantor Thomas Selle, in his guidelines for instrumentalists, recommends that each of the 5 performers (minimum) be proficient on a number of instruments: 2 cornettists should also bring violins and recorders, an alto trombonist should also play violin and recorder, another trombonist should be capable of playing tenor trombone, bass trombone, tenor violin, and recorder, and a string bass player should also play bassoon, dulcian, and bass trombone (Buelow, Protestant 192). 1642—Modena, Italy: Marco Uccellini scores for trombone and violin in his 2-part Sonata Seconda La Bucefalsca (Winkler 303; Selfridge-Field, Instrumentation). 1642—Brussels, Belgium: Nicolas a Kempis writes Symphonia 2. XXI for 3 strings and trombone, Symphonia XXII for 4 strings and trombone, and Symphonia XXIII for 4 strings and 2 trombones (Winkler 303). 1643—London, England: A painting on an the case of an organ by Christian Smith depicts a trombonist (see below image; public domain) (Parrott, Grett and Solompne Singing). 1643—Nuremberg, Germany: A male chorus and 4 trombones perform a “funeral composition” at a pageant-concert given by Nuremberg civic musicians. 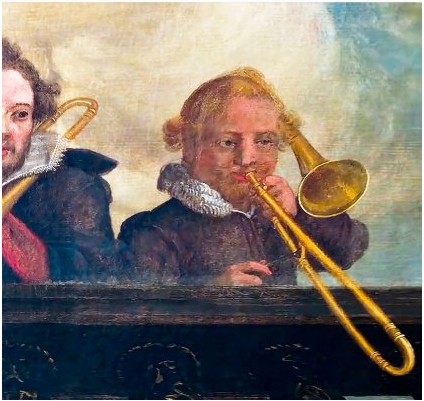 According to Whitwell, among German civic musicians, “The most frequently used instruments, and the highest ranking in [their] hierarchy, were the cornetts and trombones” (Whitwell, Baroque 150). 1643—Johann Erasmus Kindermann publishes a collection of works that includes Symphonia in D-flat, Sonata, Sonata in D, Symphonia in D, Symphonia in F, and Rittornello in G, all for trombone, 2 cornetts, and basso continuo. Also included are Symphonia in E for 3 trombones, Intrada in C for 2 trombones and 3 cornetts, and Symphonia for 3 trombones and 2 cornetts (Whitwell, Catalog Baroque 132). 1643—Hamburg, Germany: Kantor Thomas Selle composes a St. John Passion that features prominent use of trombone (Buelow, Protestant 191). 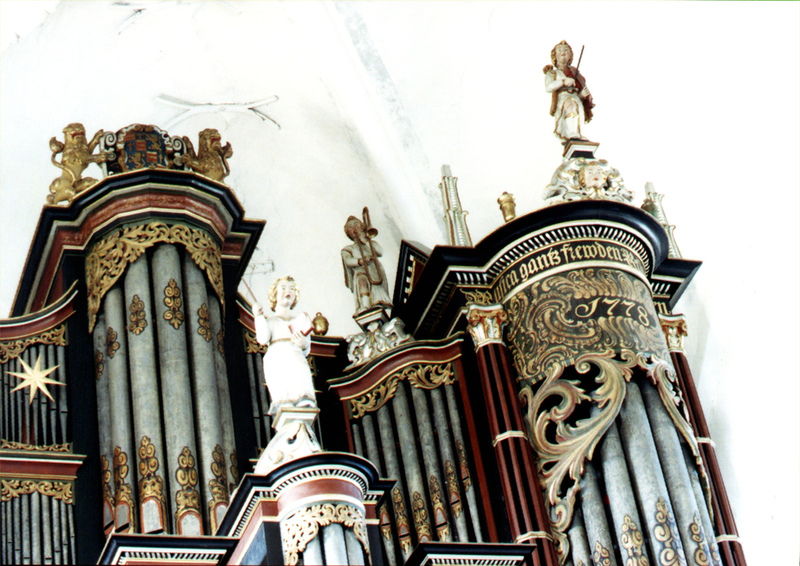 1643—Berne, Niedersachsen, Germany: Renovations of the organ at St. Aegidius Church are completed by Harmen Kröger. 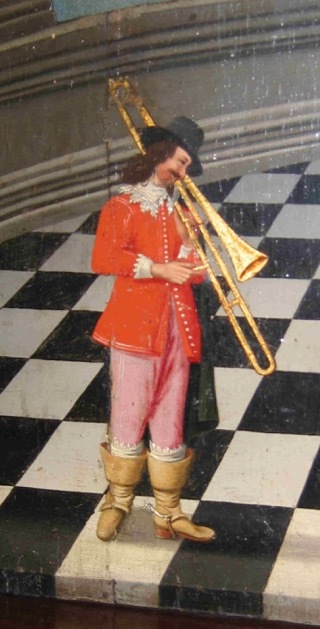 It is probably at this time (or possibly at the 1714 renovation by Christian Vater) that a sculpture of a trombonist is added to the organ case (see below image; public domain) (Seggermann 29, 53). 1644—Rome, Italy: Trombones are among musicians in the Piazza Navona who perform to celebrate the accession of Innocent X to the papacy. 30 vocalists are accompanied by an ensemble of 6 trombones, 2 cornetti, four violins, a violone, and an organ (Spitzer 63). 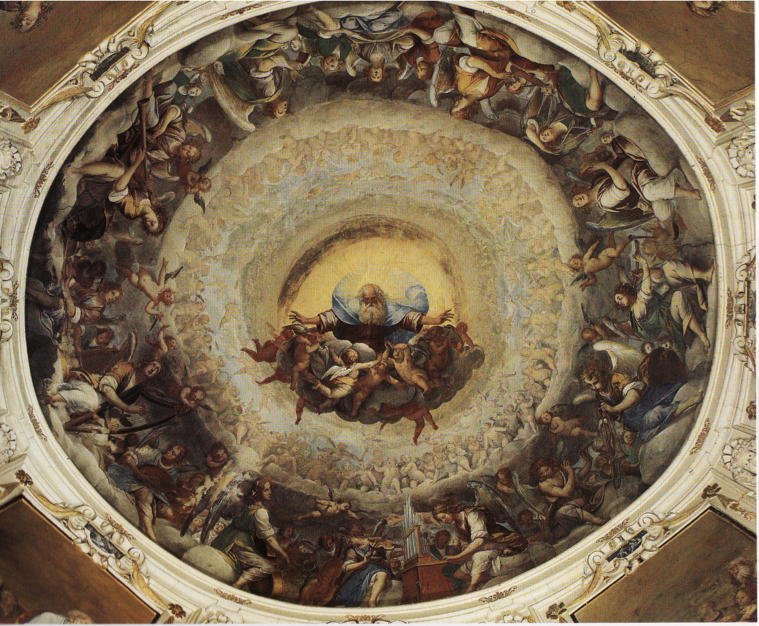 1644—Florence, Italy: Il Volterrano (also known variously as Baldassare Franceschini and Franceschini Baldassare detto Volterrano) is commissioned to paint a lunette fresco in Florence’s Santissima Annunziata. He makes a red-chalk preparatory sketch for the painting (see below) that is quite similar to the final painting (see lower image, below). (For 2 even earlier preparatory sketches, see www.kimballtrombone.com/2010/the-evolution-of-a-trombone-painting.) The images feature angels playing violin, trombone, and lute (public domain images) (Strozzi 332; Falletti 76). 1644—London, England: Expressing a Puritan element within the Anglican church, Sir Edward Dering says, “One single groan in the Spirit, is worth the Diapson of all the Church-Musick in the world. Organs, Sackbuts, Recorders, Cornets, &c. and voices are mingled together, as if we would catch God Almighty with the fine ayre of an Anthem, whilst few present do or can understand” (Parrott, Grett and Solompne Singing). 1644—Paul Schäffer calls for 2 trombones in his Jauchzet dem Herrn alle Welt (Collver 162). c. 1645—Campione d’Italia, Italy: Isidoro Bianchi paints Gloria d’angeli, a fresco in the sanctuary of S. Maria dei Ghirli. 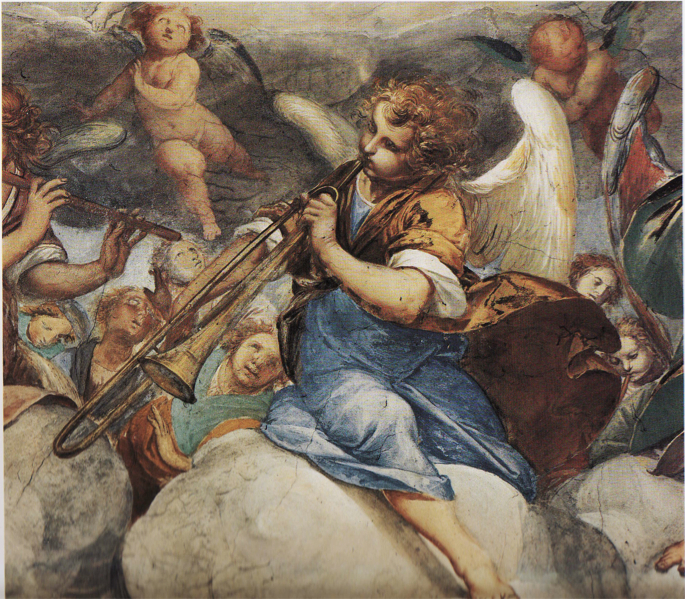 The painting includes an angel playing what may be an awkwardly-rendered trombone, with a slide clearly visible but without the rear bow of the instrument extending behind the head (see detail and full image below; public domain) (Angelis 43). 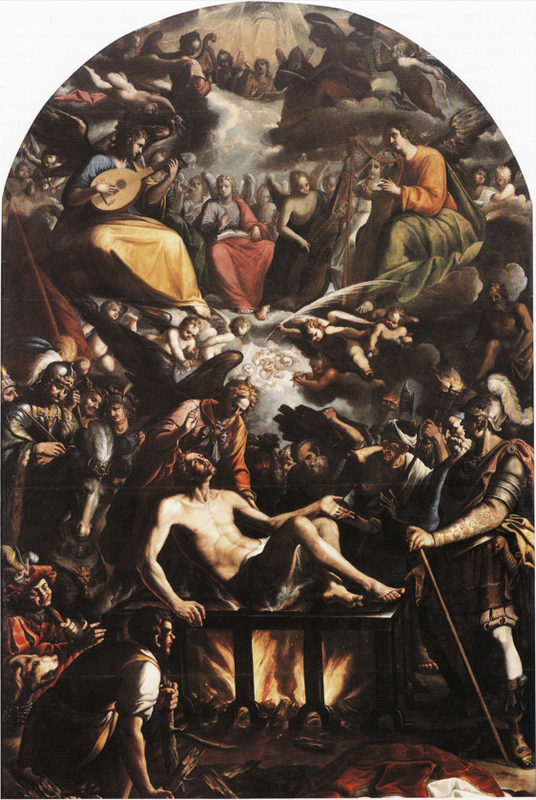 For a similar rendering by the same artist, see 1623, above. c. 1645—Denmark: Allegory of the Sense of Hearing, a painting attributed Karel van Mander III, includes a depiction of a trombone (see below image; public domain) (Rijksmuseum). 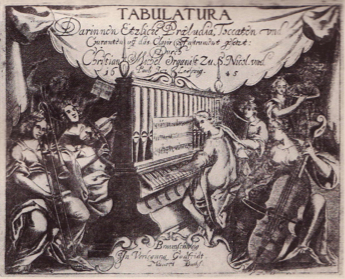 1645—Leipzig, Germany: The title page of Michel Christian’s Auf das Clavier-Instrument includes a depiction of a female trombonist performing with a diverse ensemble of other instrumentalists (see below image; public domain) (Kinsky 179). 1646—Andreas Hammerschmidt (c. 1611-1675) publishes the collection Vierdter Theil, which calls for trombone extensively. For example, Wer waltzet uns den Stein, Herr höre und sey mir gnädig, Laudate servi Domini, Verleih uns Friede genädiglich, and Alleluia lobet den Herren in seinem Heiligthumb all call for 3 trombones (Collver 119). 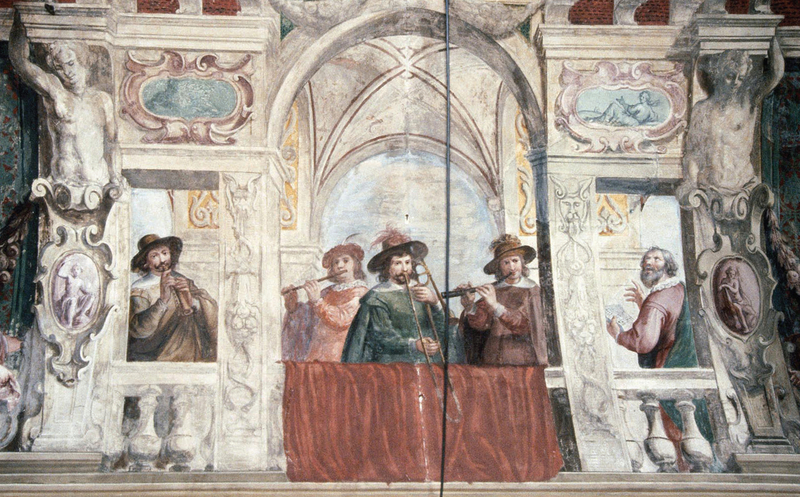 1646-47—Sassuolo, Italy: Artists Angelo Michele Colonna (sometimes known as Michelangelo Colonna) and Agostino Mitelli collaborate on a mural in the Palazzo Ducale di Sassuolo that depicts a trombone and 3 other instruments playing in a balcony (see first image below; public domain) (Southorn, front jacket; Sala della Guardia, Palazzo Ducale, Sassuolo). 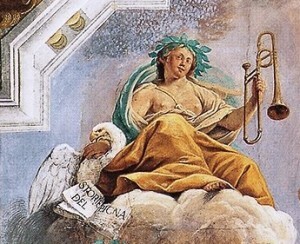 Another image by Colonna, a muse holding a trombone, decorates the ceiling of the same room, the salone (see second image below; public domain image) (Pirondini 251). Special thanks to Tassos Dimitriadis. 1647—Venice, Italy: Trombonist-composer Paul Hainlein, who is visiting from Germany, complains about the quality of trombonists in Venice: “I have no desire to study with what passes as a trombonist here, for I have heard much better players before. I don’t think that much attention is given to this instrument in all of Italy—even in Rome. I wouldn’t know at this time where a really good artist on this instrument could be found. I also have no desire to spend much money on this, because all I need is practice” (Samuel 15). 1647—Vienna, Austria: In his motet, Cantate gentes, Giovanni Valentini calls for 7-part choir, along with an instrumental ensemble of 3 cornetti, violetta, viola, 2 trombones, and organ. The ensemble plays an introductory sonata and interludes between the 4 verses of the motet. Valentini indicates optional substitutions for 3 of the parts: “Piffaro o Cornetto tertio,” “Alto Trombone o Violetta primo,” and “Viola o Trombone secondo” (Saunders, The Hapsburg Court of Ferdinand II). 1647—Soraya, Peru: The Church of Soraya (Aymaraes) lists in its inventory a trombone, a cornett, an organ, a set of shawms, two bajones, a consort of 7 recorders, and a bajonçillo (Baker, Imposing Harmony 200). 1647—Germany: Friedrich Behaim, patron of composer-trombonist Paul Hainlein’s studies in Italy, summarizes his answer to Hainlein’s letter (above): “It is most important now that he try by whatever means to learn the language and also look—even outside Venice—for a good trombone teacher. So that he will be more acceptable to the teacher, he should present him with a good trombone. He shall practice this instrument industriously and perfect himself on it, as well as on the violin and clavier, so that he will be able to bring back a good style, to instruct others, and to organize a good musical life here.” To this end, a trombone is actually purchased by his father and sent to the son, but no record exists that it is ever presented to a teacher (Samuel 16). 1647—Venice, Italy: Trombonist-composer Paul Hainlein records in his diary that, while visiting in Venice, he hears in the Church of Saints Giovanni and Paolo an alto vocalist accompanied by 4 trombones, with another vocalist echoing from afar (Marcuse 811). 1647—Hainlein’s description of a Vespers service in San Francesco della Vigna says the orchestra includes 4 trombones. 1647—Antwerp, Belgium: Nicolaus a Kempis scores specifically for trombone in 3 works: Symphonia 1 for cornett, violin, and trombone, Symphonie 1 for trombone and 3 strings, and Symphonie 2 for trombone and 3 strings (Winkler 303). 1647—England: Popular playwright John Fletcher writes The Little French Lawyer. In the play, a group of women imprisoned in a dark cave are terrified by “A Horrid noise of Musique within….A strange Musick. Sackbut & Troop Music” (Ingram 90). 1648—Vienna, Austria: An engraving by Michael Frommer on title page from Currus Triumphalis by Andreas Rauch depicts 4 angels playing trombone among other angel musicians (see below image; public domain) (Naylor 217). 1648—Nuremberg, Germany: City payrolls show 3 trombones on salary. One of the 3 players is also an instrument maker (Samuel 9). 1648—Leipzig, Germany: Stephan Otto publishes his vocal collection, Kronen Krönlein. Several pieces in the collection specify trombones, including Sihe meine Freundin and O ihr lieben Hirten, both of which call for “trombone picciolo” and 2 trombones (Collver 142). Less than 30 years earlier, Praetorius had stated the following about trombone terminology used by Italians: “The word trombone is usually used for the tenor sackbut; bass sackbut, however, is called trombone majore and alto sackbut is trombone picciolo…” (Praetorius III Kite-Powell 132). 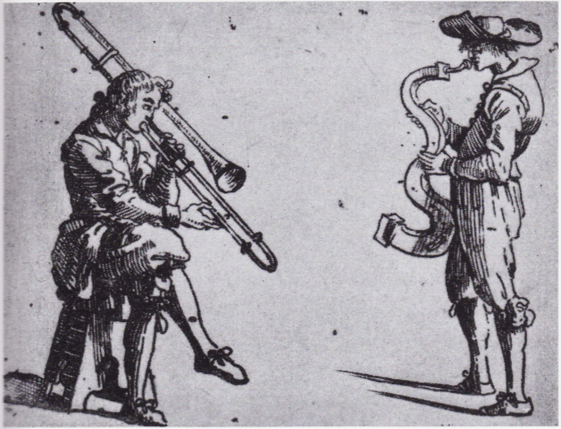 And in the illustrations of his Sciagraphia of 1620, Praetorius clearly shows the alto trombone as a shorter instrument than the tenor trombone (Praetorius II, plate 8). 1648—Bergamo, Italy: Cazzati calls for trombone in a collection of sonatas and canzoni (Selfridge-Field, Instrumentation). 1648—Johann Rosenmüller scores for soprano voice, 2 violas or trombones, violone or trombone, and basso continuo in Lieber Herre Gott (Leonard, The Role of the Trombone…Mid- and Late Seventeenth Century). 1648—Johann Rosenmüller scores for alto voices, 3 violas or trombones, violone or trombone, and basso continuo in O admirabile commercium (Leonard, The Role of the Trombone…Mid- and Late Seventeenth Century). 1649—An engraving by Georg Daniel Heumann depicting the visit of the Field Marshall, who later became King Karl Gustav, to the Nuremberg Courthouse, includes several trombonists in the antiphonal ensembles. 1649—Nuremberg, Germany: Johann Andreas Herbst writes the cantata Danket dem Herrn, den er ist freundlich, which calls for 3 choirs: a choir of solo voices, a choir of violins, and a choir of trombones (Samuel 77). The same year, Herbst also writes Danck- und Lobgesang, which uses 4 trombones (Collver 122). 1649—Milan, Italy: Biagio Marini calls for trombone in a collection of his works (Selfridge-Field, Instrumentation). 1649—Emperor Ferdinand III composes Hymnus de Nativitate, a work for chorus and instruments that includes 2 trombones (Whitwell, Catalog Baroque 3). 1649—J. Hentzschel writes Canzon for 8 trombones or violdigamben and basso continuo (Whitwell, Catalog Baroque 130). 1649—Antwerp, Belgium: Nicolaus a Kempis writes several symphonias in which he scores specifically for trombone: Symphonia 1. XVIII for 2 violins and trombone; Symphonia 2. XIX for horn, violin, and trombone; Symphonia XXII for 2 violins, tenore viola or trombone, and basso viola; Symphonia 2. XXIII for 2 violins, tenore viola or trombone, and bass viola (Winkler 304). 1649—Vienna, Austria: Perro calls for trombone in his collection of sonatas (Selfridge-Field, Instrumentation). 1649—Vienna, Austria: Marco Antonio Ferro, lutenist at the court of Emperor Ferdinand III in Vienna, publishes his Sonata a due, tre, e quatro in Venice. The work, comprising 12 ensemble sonatas for strings, specifies alternative scorings, 3 of which include trombone: Sonata 5 for violin, tenore da gamba, viola da gamba or cornetto, trombone, and tiorba; Sonata 8 for 2 violins, violetta da braccio, viola da gamba or 2 cornetti, trombone, and fagotto; Sonata 11 for 2 violins, violetta da braccio, viola da gamba or 2 cornetti, trombone, and bassoon (Winkler 303; Apel, Italian Violin Music 147; Collver 49). 1649-1701—Nuremberg, Germany: Wolff Birckholtz manufactures what is possibly the earliest extant alto trombone. 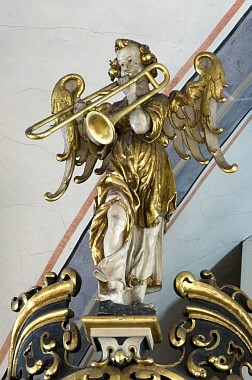 The instrument is held in Marienkirche, Gdansk (Herbert, Trombone 313). 1649-52—Poland: Lists of payments made to musicians at the royal chapel show 3 trombonists in the chapel’s ensemble of 36 adult musicians (Przybyszewska-Jarminska, The History of Music in Poland: The Baroque, Part 1, p. 72). 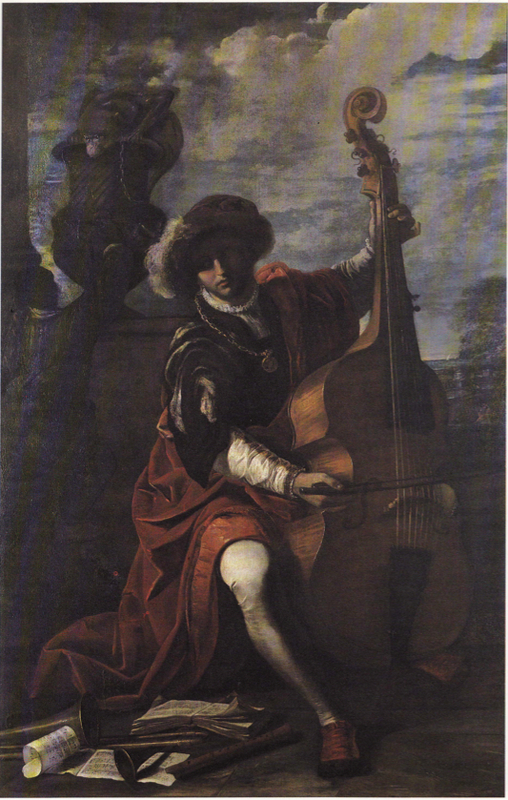 c. 1650—Italy: Swiss-born artist Pier Francesco Mola includes a trombone at the foot of his painting, Young Musician Playing a Viola da Gamba. 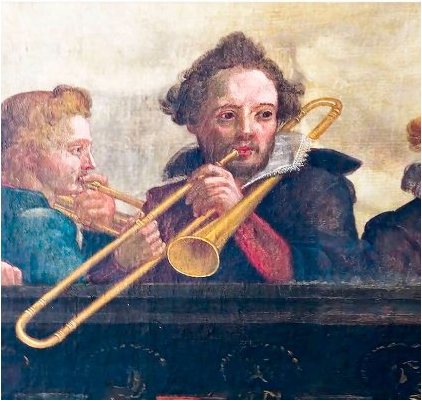 Although it is impossible determine with certainty, the instrument may be an alto trombone, given its size relative to the nearby instruments and music pages, in addition to its proportion relative to the musician (see detail and full image below; public domain) (Mola 161). 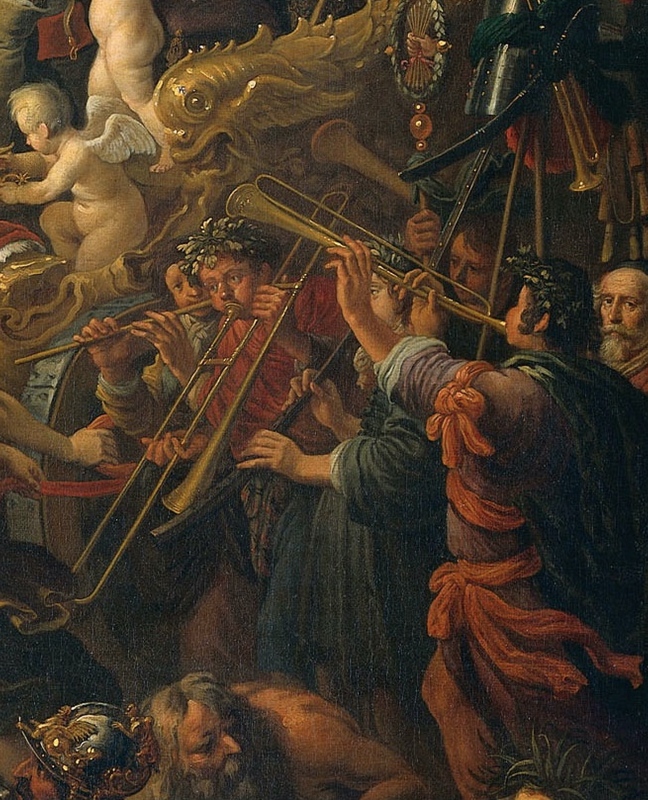 c. 1650—Mexico City, Mexico: The Martyrdom of St. Lawrence, an oil painting by José Juárez, depicts a trombone-playing angel with several other angel-musicians (see detail and full image below; public domain) (Toussaint 227; Juárez 156). c. 1650—Poland: Bartlomiej Pekiel’s Missa Concertata La Lombardesca calls for an instrumental accompaniment of 2 violins and 3 trombones (labeled alto, tenore, and grosso) (Przybyszewska-Jarminska, Baroque part I, 261). 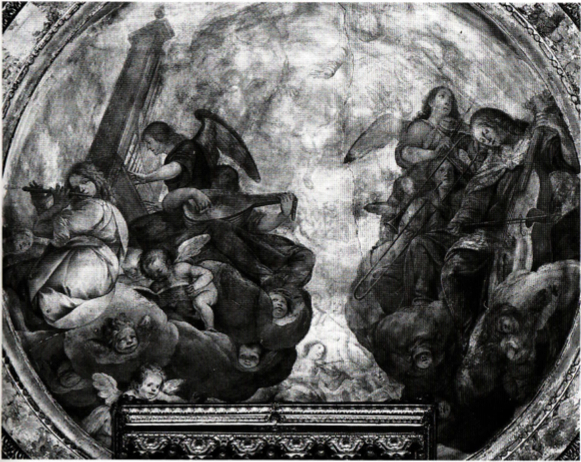 c. 1650—Venice, Italy: A performance at the Basilica di SS. Giovanni e Paolo before and during High Mass and at Vespers for the Dominican Order’s Feast of the Holy Rosary consists of music composed and conducted by Giovanni Rovetta. Four antiphonal choirs include about 40 singers, 6 violinists, 4 trombonists, and an organist (Baldauf-Berdes 39). 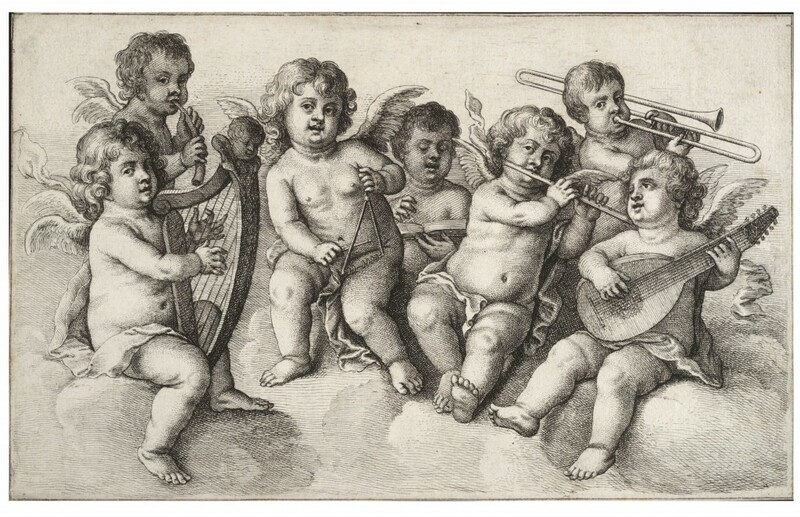 c. 1650—Artist Wenzel Hollar (known as Wenceslas Hollar in England) includes a trombone-playing putto in his print, Concert of Putti in the Clouds (see below image; public domain) (source: Wenceslas Hollar Digital Collection, University of Toronto, Pl. P500). c. 1650—Anonymous, 4 Sonatas for 5 trombones or bombardi (shawms) and basso continuo ad.lib. (Gorxheim: Parow’sche Musikalien, 1994). c. 1650—Vienna, Austria: Antonio Bertali writes 6 Sonate a 6, which call for “2 violini o cornetti e 3 viole o tromboni col basso per l’organo” (Bertali, 13 sonate manoscritte). c. 1650—Instrumentälischer Bettlermantl (“An Instrumental Patchwork”), an anonymous musical compendium written in German and Latin, offers illustrations of 4 sizes of trombones with their respective slide positions (Campbell, Instrumentälischer). 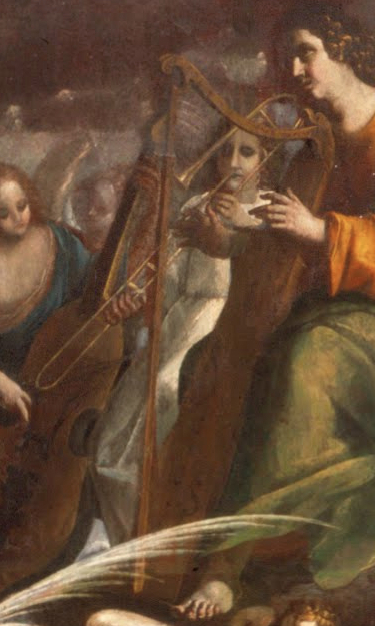 c. 1650—Netherlands: Cesar van Everdingen includes what appears to be a trombone among several instruments at the bottom of the image in his painting, Four Muses and Pegasus on Parnassus (see below detail; public domain) (Huis ten Bosch, The Hague). 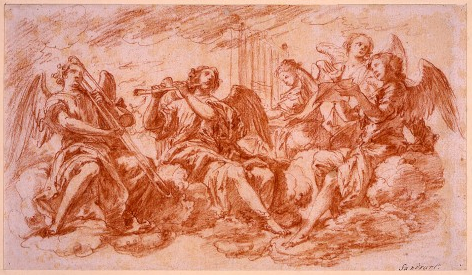 c. 1650—German artist Joachim von Sandrart draws an “angel concert” in red chalk that includes a trombone (see below image; public domain) (source: Deutsche Fotothek). 1650—Hamburg, Germany: A service of thanksgiving for the peace includes a civic wind band of trombones, cornetts, and dulcians (Whitwell, Baroque 204). 1650—Nuremberg, Germany: Johann Andreas Herbst writes the cantata, Wenn wir in Höchsten Nöten sein, which calls for 4 trombones in one of 3 choirs (Samuel 93). 1650—Podkamien, Poland: A musician by the name of Dionizy Bilinski is active as a trombonist in the music ensemble at the Dominican monastery (Przybyszewska-Jarminska, The History of Music in Poland: The Baroque, Part 1, p. 107). 1650—Rome, Italy: Athanasius Kircher depicts and briefly describes the trombone in his Musurgia universalis. He labels the trombone Tuba ductilis, as opposed to the trumpet, labeled Tuba ordinaria (see below detail; public domain, source: wikimedia commons) (Guion, Missing Link). 1650—Florence, Italy: Severo Bonini’s Discorsi e Regole mentions trombones: “Many other wind instruments came from the pipe such as flutes (which were introduced into Italy by the Gauls) and transverse flutes (which were introduced by the Swiss). 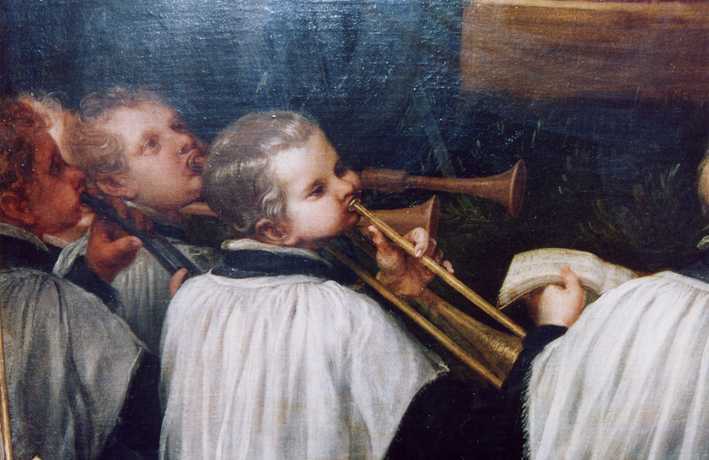 Later, the more artful and difficult cornetts and trombones [tromboni] were invented. The Saxons invented trombones, and in Nuremberg they fashion them perfectly” (Bonini 34). Speaking of funeral music, Bonini says, “Even today this practice is maintained, particularly in the Romagna, where they accompany [the dead] with mournful songs and the playing of trombones [tromboni]” (Bonini 79). 1650—Bologna, Italy: Reference is made to an instrumentalist named Giovanni Battista degli Antonii, who is admitted as a member of Concerto Palatino: “It was ordered that the Palatine Musicians should be called to play with the said G.B., flautist and trombonist” (Allsop, Secular Influences). 1650—Turin, Italy: Marriage festivities for Princess Adelaide of Savoy and Prince Ferdinand Maria of Bavaria include trombones. First, on the way to the Cathedral of San Giovanni for the service itself, “Swiss Guards and arquebusiers of Their Majesties…lent their presence to the retinue setting out for the cathedral from the great hall of the palace [along] with trumpets, trombones, oboes and drums.” After the wedding service there are “signals by trumpets and trombones to those present who, because of the huge crowd, couldn’t observe the nuptials.” Later, during a series of races in the palace courtyard, races alternate with musical performances by musicians in a gallery (see below image, an engraving by Tomasso Borgonio titled Gli Hercoli domatori; public domain): “From the other palace, above the gallery, among the various events alternating with the races was the reverberation of the sound of an ensemble of instruments; that is, trumpets which, animated by the virtue of such glorious love [of the newlyweds] became the voices of Fame; trombones, which, with harmonious notes echoed the praises of everyone, rousing more ardently by the hour the affections…” (Bowles 275-279; Tim Carter, North Italian 42). 1650-51—Rome, Italy: In the Church of Sant’Andrea della Valle, a large fresco by Mattia Preti depicting the crucifixion of St. Andrew, includes a trombone-playing angel (see detail and full image below; public domain).